Faith has been one of the most consistently entertaining comics released this year. In fact when a person’s only complaint is that it’s a four issue miniseries and not an ongoing series, then I think that’s a pretty good sign that this is worth picking up. Jody Houser has shaped a story that is in part very much an homage Clark Kent’s normal life with a nice modern reinterpretation. By having Faith work at a Buzzfeed-like website where her dreams of becoming a great investigative reporter have been stalled by being assigned to write inane clickbait listicles because that’s what gets the traffic. The writer mentioned on Graphic Policy Radio (found on iTunes here – the Jody Houser episode will be around 18-20 on the list depending on when you look) that Faith decided to become a journalist because that’s what heroes do (both Spider-Man and Superman), and there’s a lot of great touches like that within this series, and more than a few come from Faith‘s inner monologue. This issue alone, Faith has to risk her secret identity to save the lives of her co-workers, and the way she figures out how to do that gives us one of the highlights of the series so far. In fact, that entire scene is probably one of my favourite scenes of this year. Why is it one of my favourite scenes? Well there’s just this moment of clarity for Faith as she’s stuck between a rock and a hard place, and the expression on the hero’s face as she makes her decision and literally comes out of the closet as Zephyr in front her colleagues is fantastic. Her snap decision that saving a life is far more important than a secret identity is amazingly well realized on the page, both through Houser‘s superb writing and the beautiful artwork from Francis Portela and Marguerite Sauvage. It’s fantastic. Initially I felt that it was a fun scene that was certainly a highlight of the comic, but then I sat down and thought about it. Those few pages where Faith was trying to decide how can she do this? How can she save three lives and keep her secret identity? That her dilemma takes place with a closet is fantastic, and when she bursts forth, Houser is saying that this woman is here, and she’s here to stay. By writing a character who loves being a superhero, Houser is reinforcing why I love superhero comics in the first place. There’s just this brilliance about Faith, and a lot of that is because of Faith herself; she’s a shining light in a sea of dark and gritty comics that have been flooding the market recently. I really can’t say just how much I love the dual artwork of Francis Portela and Marguerite Sauvage; with Sauvage providing the forever entertaining sequences from Faith‘s fantasies, and Portela providing the artwork for what is actually going on in the comic. The differing styles are incredibly complimentary, and yet different enough to enable the reader to immediately understand what you’re seeing is real life or just a fantasy. Whether you allow yourself to get caught up in the landslide of Faith #3 and let yourself escape from reality for a short period of time is entirely up to you, but this is a comic that’ll have you looking up to the skies and seeing things with a little bit of a brighter outlook. Faith‘s positive energy is infectious; she’s working incredibly hard to become the hero that she’s been inspired too become, and despite her challenges she needs no sympathy. By trying to make a go of her life the hard way, unlike her ex-boyfriend, there’s no easy come, easy go for her. 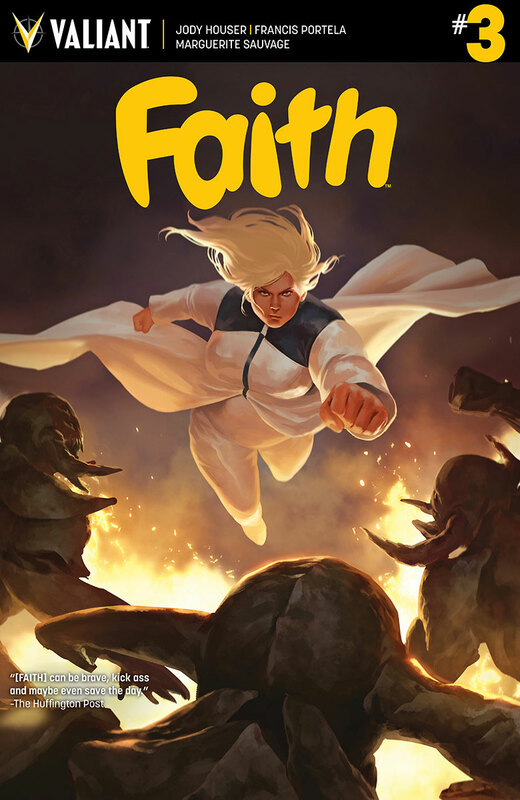 Jody Houser s writing Faith‘s life in a way that’s incredibly relateable for many of us; there are little highs and little lows here, often in the same page, and the way in which Faith deals with these trials and tribulations while still trying to be the hero she believes she can be is fantastic. I never expected to love this series as much as I do, and my only complaint is that there’s only one issue left. One thing’s for certain though, is that I’ll be following the character and the creative team wherever the wind blows. You may have noticed that I’ve pointedly avoided mentioning Faith‘s plus-sized stature so far in this review. That’s because while I am over joyed to have representation of honest to goodness female body sizes in comics, I didn’t want to encourage you to read the comic because of that – indeed her body size doesn’t really matter to me when it comes to my love of this series. You should read this comic because it’s brilliant, and because it also features a character that we need to see more of.